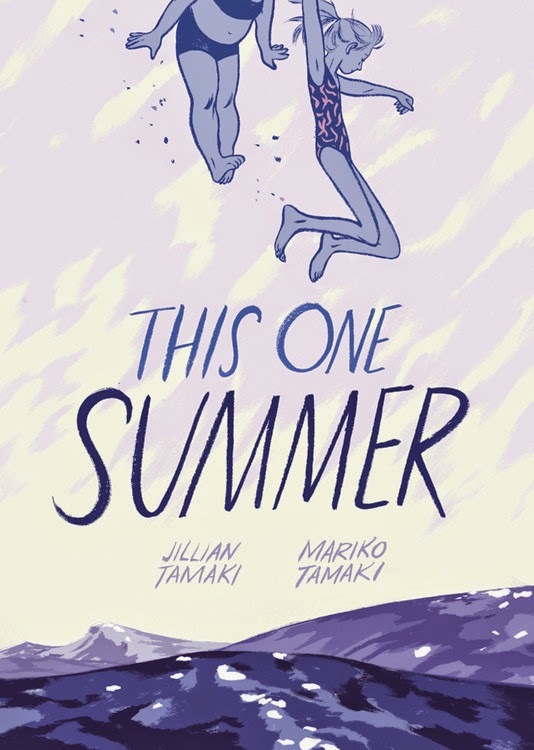 I should first disclose that This One Summer by Mariko Tamaki and Jillian Tamaki was given to me as an advanced reading copy by Groundwood Books. It's since been officially published, so it no longer counts as an advance, I suppose, but just in case someone would like to accuse me of being bought for the incredibly glowing review that follows, I invite you to write your local MP with your concerns. Coming as it does, on the eve of summer, is perfect really, especially in Canada where summer is such a special (to the point of feeling rare) treat it that it conjures up those nostalgic feelings captured so beautifully by the Tamaki cousins. Drawn spectacularly in blueish purple inks, I was reminded of old mimeographed copies from my early school days. Mistakenly I thought the story was set in the past and I believe it was the first appearance of an Angry Bird (in one of those claw vending machines) that really threw me, though it was a pleasant surprise. Instead of ruining the nostalgic vibe, it was a warm reminder that summer's are still implanting memories in today's youth. But summer nostalgia and summer memories— intertwined as they might be— aren't the same thing. Popsicles and lawn sprinklers, but a few confusing and perhaps even painful life lessons can make their way in as well. In Helpless, Neil Young sang of a town in north Ontario, and all his changes were there. Replace town with time and you'll get a perfect sense of This One Summer. I was reluctant to call This One Summer a coming-of-age story. "Aren't all YA novels coming-of-age novels?" I chastised myself. However, there's really no denying that that's what This One Summer is, and it's not a bad thing because it's so ridiculously well done. The story focuses mostly on Rose, a preadolescent, or tween I suppose, in modern lingo. She is spending time with her family at a summer cottage where she reunites with her summer cottage country friend Windy. Before long, there's a sense of change in the air that Mariko develops with an ingenious pace. First, the difference between Rose and Windy is very subtle (other than their body-types). Windy comes across as more carefree and Rose seems more distracted and curious about getting older, focused more on the problems of the local teenagers (especially a boy named Dunc). But Rose is a complex character, and one wonders if she isn't distracting herself on purpose from the problems that her parents are having. What problems are her parents having? While that too is complex, a large part of the mystery is revealed at the end and in its revelation, the seriousness of adulthood hits hard. I think it's risky when an author follows whom most authors would make peripheral characters— the ones who have less drama affecting them directly— but Rose's story was certainly the right one. It captures the helplessness many of us felt at that age, and the maturity that came from trying to unravel those mysteries we so desperately wanted unraveled.